The episode presented here was a standard story of the time: against the backdrop of domestic monetary concerns, shady financial characters and uncaring employers conspired to use unregulated economic practices to the disadvantage of helpless working men. In this particular case, the merchant Hardrun and speculator Shinner profited by reselling bank notes at a markup, an anonymous master mechanic profited by passing the discounted notes along to his employees, and hardworking journeymen suffered by getting cheated out of their earnings. This anecdote appeared in the second edition of a popular three act farce, but could easily have highlighted a trade union broadside or labor political speech. Such critiques of the potential threat to New York's working men and their families posed by the market revolution saturated organized men's cultural milieu. When organized working men left the household and engaged the developing market society, they encountered a diverse set of financial institutions and economic characters that they perceived as a threat to their ability to fulfill their idealized domestic obligations. Section One demonstrated that organized working men self-identified primarily as household actors who championed specific family obligations by seamlessly integrating their domestic activities with their outside-the-home activities in support of what they deemed to be the best interests of their families. This chapter begins Section Two by mining a seemingly disparate range of cultural sources created by and for workers in order to follow organized men out of the home and analyzing their perceived notions of market engagement during the first four decades of the nineteenth century. The resulting discussion focuses on a series of institutions and characters which organized men cited as potential threats to working men's ability to uphold their household responsibilities. These threats fell into two main categories: (1) public economic institutions—monopoly corporate charters, auctions, state, local, and national banks, paper money and bank notes, and debtors' prisons and (2) cultural economic figures—bankers, speculators, and dandies. Such threats offered varying challenges to working men: some by depriving them of equal economic opportunities which made providing for domestic obligations more difficult, some by explicitly cheating them out of resources needed for their families' survival, and some by offering alternative models for economic engagement that challenged their ideal household-based masculinity. However, no matter which potential economic hazard working men encountered, they consistently viewed all risks in terms of how they affected workers' ability to fulfill ideal domestic obligations. So, regardless of whether it was in the guise of monopoly banking, federal financial policy, or a dishonest dandy, organized men utilized a wide range of cultural outlets to describe the economic world in terms of the potential threat it posed to their families' welfare. More than any other financial menace, working men feared state-chartered monopolies that both limited free competition and benefited solitary interests over collective welfare. Led by impassioned spokesmen William Leggett, John W. Vethake, and Theodore Sedgewick Jr., pro-labor activists challenged a broad range of monopolies, including corporations, commodity auctions, state prison workshops, and of course, banks. Simply stated, workers defined a monopoly as any business or financial arrangement that obtained an official "charter of incorporation" from the legislature giving it "exclusive privilege" in its particular area of the economy.5 Organized working men objected to such state-sanctioned exclusivity because it limited "free competition in all departments of social industry" and promoted market engagement "for other purposes than the public good. "6 Corrupt monopolies, critics insisted, worked to "convert a general right into an exclusive one. They take from the many to give to the few. "7 In this reading, working families accounted for the many and rich capitalists accounted for the few. Anti-monopolists instead favored general incorporation laws that would have allowed any individual or group of individuals to form any type of business. Most journeymen understood that they did not have the funds to start their own business, but they still objected to any barriers to applying their labor however they felt could best help themselves and their families. The greatest potential threat from the application of monopoly charters in the early nineteenth century came from the vast cross section of business endeavors which directly affected journeymen's economic lives and households. Monopoly corporations seemed to handle every new financial project in the city. William Leggett wrote that "not a road can be opened, not a bridge can be built, not a canal can be dug, but a charter of exclusive privileges must be granted for the purpose. "8 Organized men viewed the growing influence of monopolies and their system of market engagement especially pernicious because of their encroachment into the domestic arena. Working men argued that they could not properly govern and support their households "without paying tribute to monopoly." They noted that, "our bread, our meat, our vegetables, our fuel, all, all pay tribute to monopolists. "9 As will be examined in the concluding chapter, such anger bubbled over in February 1837 when rioters in the city's Flour Riot singled out those merchants they regarded as hoarding monopolists. State-chartered monopolies particularly raised labor organizers' ire because they functioned as contrary to working men's model of collective market engagement in the abstract and in actuality as a means of depriving journeymen and their families of financial resources and opportunities. Two features of the auction system especially offended working men as household consumers: the violent, rapid price fluctuations associated with auction sales and the very small cadre of men licensed by the state to participate in such auctioneering.12 Wild price variance led critics to charge that auctions resembled gambling and inspired one observer to note that "every one knows that an auction is the place where cheats, deceptions, and impositions, are constantly practiced with perfect impunity. "13 For artisans who prided themselves on the value of hard work and fair pay for fair labor, the abandonment of fixed prices smacked of dishonesty and corruption. Also troubling was the exclusivity of auctioneering based on a grant from the governor. Only certain men participated in the process and only certain men seemed to be garnering all the profits. When a well-organized, anti-auction movement coalesced in 1828, it cited the auction's monopolistic aspect in its warning that the families of small merchants and mechanics suffered unfairly from the existing system. The anti-auctioneers found it easy to argue that "auctions are a monopoly; and, like all monopolies, are unjust, by giving to the few, that which ought to be distributed among the . . . community generally. "14 Between 1815 and 1830, the governor issued fewer then fifty auctioneering charters and just six large (and very profitable) auction houses handled the vast majority of the business.15 Anti-auction activists cited these numbers in their declaration that the "tendency of this monopoly" was "to divide society into the very rich and the poor. Under such a system, how shall we be able to introduce our children into active life? "16 The protesters objected to the auction system's method of market engagement, which prided itself on reckless speculation, price manipulation, and especially restrictive and specialized treatment for certain insiders.17 Not wanting their own families to suffer from auctions or their own children to emulate the lessons of auction practices, anti-auctioneers proposed more stable commodity-pricing and straightforward, honest sales. Nowhere was the disapproval of monopolies greater than in labor activists' arguments about public economic policy and the chartering of state and local banks. Even without reference to monopoly practices specifically, working men did not usually trust that banks promoted their families' best interests and disagreed with banks' selective approach to aiding individuals trying to participate in the financial sector. Artisans' strained relationship with credit-lending banks derived from the banks' historic pattern of not offering loans to journeymen trying to engage the market and benefit their households by setting up their own workshops. The Evening Post noted in 1804 that "the application of the laborious mechanic is treated with contempt and rejected with disdain. "18 Furthermore, when a Mechanics Bank did open, its directors and large customers tended to be manufacturers more often than craftsmen and average journeymen still failed to obtain easy credit. Not all banks treated journeymen contemptuously, but even financial institutions which sought artisan customers often failed working men in their attempts to engage the market revolution on their own terms. The Exchange Bank was a private operation run by Jacob Barker who supposedly catered to mechanics; they in turn came to its aid in 1818, when the state legislature sought to restrict banks without official corporate charters. A meeting of artisans at Tammany Hall resolved to defend Barker against the legislature's policy of special treatment for monopolies by arguing that "banking can be conducted by individuals, as much more beneficially for themselves and advantageously for the public, as any other business may be managed by an individual better than by an incorporated company. "22 In this case, working men supported Barker's individual economic approach because it served their families (the public), and offered a more democratic model than did banks with monopoly charters. The state legislature responded favorably to the petition and gave Jacob Barker's Exchange Bank an exception to the monopoly policy. 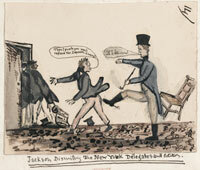 However, Barker disappointed journeymen and others shortly after, when he stopped redeeming his bank notes during the Panic of 1819 and left many working men holding worthless bills.23 $5 Note From Jacob Barker's Exchange Bank The failure of so many banks in the aftermath of the financial panic inspired organized men to press the state legislature for investment insurance. They succeeded in 1829 with the passage of the Safety Fund Banking Act, but the move came too late to save many artisans' money or Jacob Barker's name.24 Barker was convicted of fraud in 1826 and although he avoided a prison sentence, he became, as we shall see, a representative character in cultural depictions of corrupt and threatening economic behavior. The Barker affair and the proliferation of paper bank notes in the early nineteenth century demonstrated that it was not merely the existence of savings or credit-lending banks that potentially threatened organized men; it was how these institutions dispersed their funds and how those funds affected working men and their families. Almost no working men used specie as their main means of exchange. Most employers paid journeymen on Saturday night with bank notes they purchased at a one to one-and-a-half percent discount of face value.25 Federal Bronze One Cent Piece, 1837 Bosses made a habit of collecting these discount bills (from out-of-town or potentially insolvent banks) on Saturday mornings at Wall Street money markets. Forced to take the "uncurrent bank notes" or not receive payment at all, working men consistently lost a portion of their weekly earnings because they could not redeem the bills for their face value.26 Every week, one could be paid in notes supposedly worth $8.25 that could only be redeemed on the street for $7 or $7.50. Image Satirizing Faulty Economic Policy and Uncurrent Bank Notes William Leggett wrote that "if a master mechanic has a thousand dollars a week to pay to his hands, it is clear that he pockets every week by this operation some ten or fifteen dollars; and it can be shown with equal clearness that those in his employment are defrauded out of this sum. "27 Multiplied over an entire year, the consistent use of uncurrent bank notes short-changed hard-working journeymen of hundreds of dollars they had earned and needed for their families' maintenance. As uncurrent notes circulated around the neighborhood, they also caused further harm for working households. One of the first stops for a working man with his pay was the local market, where the notes directly fulfilled their breadwinning duties, and passed the cost of redeeming discounted notes and the hassle of dealing with counterfeit notes on to the next link in the economic chain. 28 Grocers raised prices for their wares in order to cover their losses and, as one paper reported, subsequently demanded more from the "labourer, when he comes for his tea and sugar and other little necessaries and comforts for his family. "29 A "journeyman printer" likewise noted that even if, as a few economists argued, the use of paper notes manipulated wages upward, the circulation of the tainted money and inflation "makes bread and meat dearer also, and thus the working man loses. "30 For organized men, a simple solution to the problem would have been the elimination of bank notes (especially in small denominations) and the insistence on a specie-only local economy. In this view, the reach of monopoly banks and the paper money system into the workplace and domestic lives of working men was complete, in some ways sentencing him and his family to a particular fate from which the did not have any recourse. Poet John Needham lamented that bank notes created "envy, hatred, theft, and strife" and made "friends quarrel, severs man and wife! "33 Paper money was then not just a nuisance, but a perceived institutional threat to working men and their ability to keep their families together and provide them with a better life. For working followers of William Gouge's principles, paper money was a shell game that created wealth out of thin air instead of through hard work and it punished the families of tradesmen who relied on honest mechanical skills to provide for their households' best interests. They instead championed hard money as a form of real property which working men could build on for social advancement. Gouge encouraged such sentiments, writing that when "you deprive a man of property [specie], you may thereby deprive him of the means of properly educating his children, and thus affect the moral and intellectual character of his descendants for several generations." Turning the Society for the Prevention of Pauperism savings bank argument on its head, working men often cited dishonest bankers who "neither work nor save" as the cause of their children's economic and educational poverty. Gouge buttressed this point, noting that "banking has a more extensive effect on the moral character of the community" because it forces the journeyman's strength to become "exhausted in providing bread for themselves and their family. They cannot attend properly to the formation of the moral character of their offspring—the most important branch of education. "37 Although many working fathers probably took exception to Gouge's criticism of their parenting skills, they sympathized with the notion that corrupt business and banking policies required them to divert time and attention they preferred to spend on their families. Like other aspects of the market revolution, organized laborers perceived paper money policy and the money market as they related to their families' economies and formed institutional critiques as they pertained to household concerns. The complexity of working husbands' and fathers' relationship to the market and economic institutions was best demonstrated by organized men's divided support for Andrew Jackson's war on the Second Bank of the United States (BUS). What was at stake was more than just simple hatred of banks or a fear of the threat of Jackson's power; it was a split over which vision of public economic policy would most benefit working men and their families. In the early and mid-1830s, some journeymen artisans aligned on one side to protest the BUS' influence over the national economy and on the other side to support its re-charter in order to protect the nation's supply of financial credit, but what was really at issue was the survival of the family. In a typical petition to Congress signed by dozens of New York's organized working men, Oramel Bingham, David Kilmer, Israel Pierson, David Bruce Jr., William N. Smart, and Billings Hayward and others expressed concerns about the "morals and happiness of every man, woman, and child" if Congress did not do more to properly regulate the "distribution of money. "40 Just as economic historians continue to disagree about the actual effect of Jackson's decision to withdraw deposits from the BUS, New York's mechanics and artisans at the time did not see eye-to-eye on the issue.41 Organized men's lack of unanimity is far less important than the fact that both groups of working men publicly discussed their economic policy positions as they related to potential threats to household maintenance and idealized domestic masculine roles. The men who supported the removal of bank deposits from the BUS included Henry George Evans, editor of The Man and the Working Man's Advocate, GTU leader John Commerford, Working Men's Party and GTU delegate Willoughby Lynde, Loco Foco candidate Moses Jaques, and trade union hatter Moses Perego. Showing that this was also a family affair, groups of pro-labor relatives, such as brothers Frederick and Matthias Rowland or James Sickels Jr. and Daniel Sickles often joined together to sign petitions. Anti-BUS working men supported Jackson's offensive by arguing that the national bank's immense power and resources further strapped their already economically vulnerable working families and forced them to resist its aristocratic corruption. While BUS supporters favored a national bank to protect their families from poverty, anti-BUS men responded that the national bank was responsible for facilitating those very problems by causing poverty through its financial abuses. There was nothing particularly revolutionary about either of these appeals and they represent just a few of dozens of petitions sent to Congress during the Bank War period, but they do demonstrate that whether it was through locally published pamphlets or petitions bound for Washington D.C., organized men's writings on public monetary policy and institutions reflected a single-mindedness about the importance of the household to economic issues. So, although organized laborers split over which aspect of the banking system caused their present difficulties, they agreed that current financial policy adversely affected their family economies and it was their responsibility, as husbands and fathers, to champion a vision of market engagement which satisfied their household obligations. A similar group of organized men from the Second Ward objected to the way Jackson, in monopolistic fashion, put his exclusive liberties above the collective good. They wrote that "from that Liberty which is subject to the will of one man both on our own, and our children's behalf, we pray deliverance. "50 Organized opponents of the BUS used their own scathing characterizations to critique bank supporters. Nicholas Biddle and Associates Screw Workers By Manipulating Credit Supply, 1834 Just as supporters of the BUS satirized Andrew Jackson's manliness to promote their position, anti-BUS men targeted Nicholas Biddle and his followers as their aristocratic foils for proper domestic masculinity. One political cartoon attacking "Old Nick" (Biddle) and his plan to manipulate the nation's credit supply focused on its effect on working men. The scene depicts a collection of masons, laborers, butchers, and other working men literally and figuratively screwed by giant printing presses manned by Biddle and several newspaper editors who supported him.51 Even as the workers below complained that the "Aristocracy and U.S. Bank power are heavy stuff," they cried out that Jackson had not given "Nick such a patent right to screw us poor workies so! "52 Andrew Jackson and Nicholas Biddle Fight Over Bank War Like the criticism of Jackson for his ungentlemanly behavior, this accusation about Nicholas Biddle and the BUS overstepping its charter spoke volumes to the laboring audience. Both comments emphasized the importance of household-based market engagement by citing how Jackson and Biddle problematically acted in self-interested and aristocratic ways at the expense of the working community and their families. Due to the personal and close-to-home nature of the banking debate, such assaults on character occurred frequently as both sides defended their vision of ideal domestic masculinity. Labor activists' most convincing arguments in favor of passing new insolvency laws stemmed from their strong objection to debtors' prisons, an objection based on their threat to the imprisoned debtor's family. Sending a husband or father to debtors' prison significantly disrupted a family's survival; the move punished the entire household because of the failure of its market representative.59 Typical anti-debtors' prison accounts questioned the toll on the family "at seeing their husbands and parents torn from their business, their families, and their homes, by the ruthless hand of a merciless creditor. "60 However, the majority of debtors' prison criticism focused on the actual material cost to a family deprived of its primary breadwinner. Such critiques argued that when creditors sent a working man to prison, "his family [was] left to weep at home, deprived of that sustenance which is necessary to support nature. "61 Likewise, they noticed that without their main financial providers, imprisoned working men's families fared worse economically and often sought poor relief from city agencies. Organized men instead wanted to secure the flexibility for failed artisans with debts to work themselves out of their problems and not lose their freedom and their families. They also asked whether it made sense, "taking the father from his family, from his wife and little ones, and incarcerating him in jail for debts which he is unable to pay. "62 Organized working men attacked debtors' prisons not only because they unfairly punished the debtor's family, but also because they signified a corrupt vision of market economics which failed to appreciate financial interactions as collective or household endeavors but reduced them to individual relationships. In addition to their fear of menacing financial mechanisms, working men who left the home to engage the market arena confronted a series of shady economic characters who threatened their ability to provide for their families and challenged their household-based masculine identity. Alongside a wide array of petitions, tracts, and treatises that cited the dangers of greedy and monopolistic institutions, organized men crafted cultural characterizations of public economic figures such as greedy bankers, deceptive dandies, and noble artisans in a series of plays, novels, poems, and songs. Citing the importance of domestic realities to outside-the-home economic endeavors, such portrayals made sure to situate these pecuniary characters in relationship to the home and family. Sometimes, they even attempted to convince a particular individual, such as banker Jacob Barker, to alter his behavior in order to assist working men and their families. Most of the time such sources simply compared men like "bankers" who supported "speculations and monopoly" through "waste and extravagance," and employers who forced "tradesmen and mechanics" to accept "bills on distant and depreciated banks," with journeymen who fulfill their duty to their "numerous family," who depended on them for "their support. "63 Overall, working men's cultural materials, like other forms of public economic criticism, illustrate that different types of men engaged the market in different ways. Labor writers created more unflattering characterizations for those who chose solitary or deceptive ways and heroic representations for those who acted as honest family representatives in the midst of the market revolution. Most widespread cultural depictions characterized bankers and investment capitalists as lazy and, like the monopolies they supported, self-interested at the expense of hard-working artisans and their families. One book entitled Cause of, and Cure for, Hard Times, stated plainly that "bankers rob every other man in society, by circulating their notes, the same as they would by taxing them, or by stealing their money out of their pockets!" It went on to proclaim that capitalists "enjoy the benefit of labor and the fruit of fraud, without laboring themselves, or running any risk of that punishment which fraud deserves. "64 Reflecting an anti-banking and anti-paper money agenda, such portrayals noted the difference between men who create wealth through actual labor and men who create wealth by pushing paper. Hostile portrayals emphasized bankers' penchant for avarice and self-interest such that they had lost any concern for their families or the wider community. Journeymen Weaving By a Journeyman Mechanic," began with the lyrics, "now, wife and children, let's be gay, my work is done, and here's the pay. "68 Rather than hoarding money or disregarding his household because of work obligations, the artisan-singer relished the end of the work week, when he could spend his time and money on his family. Adam Burt struck a related but more biting note in Journeymen Weaving, A Poem, in his discussion of a weaver's budgetary expenses. After making sure to pay for work materials and his family's "board and other shavings," the narrator lamented that the left-over amounts, "Exclude us all from Bank of Savings. "69 Burt critiqued weavers' lack of opportunity to save money and benefit from the market revolution, while informing his readers that honest and family-oriented journeymen took care of household necessities before anything else. Next to greedy, solitary bankers, the dandy character also appeared as a part of organized men's cultural arena, embodying the antithesis of the hard-working, family-oriented journeyman. In plays, poems, and jokes, skilled artisans described the foppish, unmarried men as "half complacent, brainless, heartless knaves," who deceptively posed as genteel citizens by wearing fancy clothes, such as "corsets laced as tight as fiddle strings" or "mixed silk coat[s], pink satin waistcoat[s] and breeches, covered with an elegant silver nett. "70 Like bankers, dandies corruptly created wealth without hard work, but represented an even more insidious version of masculinity because of their aims to hoodwink women rather than support them. A satire supposedly written by a dandy made sure to note that "you will find that there is no pretence of our having anything to do with the manly character. "71 One story in a pro-labor newspaper remarked that "Jackadandies" did not "deserve to be ranked among males" because they preyed upon "very sensible young girls, [who] are often deceived by their silly arts. "72 Characterization of dandies often included specific allusions to economic market behavior. References to dandies in the pro-labor press and among sources produced by working men rose dramatically during periods of financial downturn, especially in the years surrounding the Panic of 1819 and the Panic of 1837.73 Robert Townsend Jr., for example, in a speech to the Convention of Mechanics, Farmers and Workingmen, called for a society where "a dirty shirt acquired by toil" was "held more honorable than the dandy's ruffle. "74 Presented as more of a critique of aberrant behavior than as a search for a scapegoat, such citations warned hard-working artisans about competing versions of masculine conduct that posed a potential challenge to their model of domestic, workplace, and economic relations. Vermilye Taylor's plays dramatized the corruption of contemporary banking policy, the paper money system, auction sales, and imprisonment for debt. In The Banker, Or, Things as They Have Been!, Taylor described the paper money system as dependent on the whim of bankers to "not pay specie to holders of [their] bills who may be in extreme want," merely because they lost money "speculating. "80 As working men and their families learned during the Panic of 1819 and the Panic of 1837, paper money was only useful when the bank that issued it would guarantee its value and redeem it for specie. When banks chose to withhold payments, it was workers—not the bankers themselves—who were left holding the worthless bills. Taylor's characters also confront the dangers that await them if they fail in their attempts at market engagement when he raises the specter of debtors' prison. At one point in The Banker, young protagonist Heartwell is stuck in arrears with uncurrent paper money worth a fraction of its face value as his only available funds. When his future father-in-law, money broker Shaveall, hears the news, he wonders aloud if the young man will now wind up in debtors' prison with the disappearance of his "jail purse. "83 Because Heartwell was not yet married—he could not yet afford to take responsibility for a household—the specter of imprisonment did not utilize customary debates about the debtor's family; however, the possibility of incarceration provokes Shaveall to examine other suitors for his daughter, potentially costing Heartwell his chance to start a family. Taylor contrasts Habakkuk's acquisitive masculinity with those "honest tradesmen" whose dealings with banks and paper money closely relate to their family obligations and household market engagement. A working man discussing his plight with a fellow laborer in Things as They Will Be mentioned that if the banker did not redeem his bills for specie, he "shall not be enabled to procure bread for [his] family." The laborer subsequently offered him a quarter, that he himself could barely spare, for "bread and butter. "86 Taylor not only demonstrated the importance of family obligations to the economic motivation of working husbands and fathers here, but also championed their version of a domestic masculinity based on household duty and collective benefit. Such a model was placed in stark contrast to the self-interested banker who never mentions his family and seemed to desire wealth only for himself. Vermilye Taylor likewise contrasted hard-working, family-oriented artisans with dandy characters in the play, False Appearances, Or, A Hit on the Dandies. They were not an unusual target for the New York theater. In the same year the play was written, the following Chatham Garden advertisement appeared: "Admission free for those that have consciences; none for dandies. "87 Unlike working men who engaged the market on behalf of their families and for their collective benefit, the play portrays dandies as solitary figures who avoid work and the challenges of market economics by pretending to be men they are not. It was not merely their deception that threatened organized men's domestic masculinity, it was their model of masculine behavior that shirked hard work and sacrifice for the benefits of one's household. Taylor's dandies, Bob Jackanapes and his companion Tim, spent their time and energies plotting to swindle women out of their inheritances by passing themselves off as worthy gentlemen. Instead of the tools and leather apron which distinguished skilled artisans' workplace persona, the dandies utilized foppish adornments, such as "ruffles" and a borrowed frilly "waistcoat" as their accoutrements in the economic arena. The working men noted above struggled to provide food for their families, while Bob and Tim bickered over which one of them stole the last "piece of the bread and cheese." Taylor's true differentiation between dandy masculinity and worker masculinity came at the end of the play when Old Worthy, the father of the woman Bob Jackanapes attempted to swindle, learned his real identity from tinker Michael Mend'em. Bob was actually a runaway tinker's apprentice, who could not handle hard work and instead chose to "turn dandy." Mend'em concluded the play by adding to Old Worthy that "I lives at the sign of the sauce-pan, and if you have kettles to mend, or any thing of that sort, I am your man. "88 This straightforward statement reminded the audience of the superiority of his artisan masculinity. 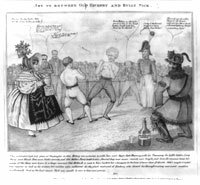 Not all Taylor's farces are so oblique: Things As They Will Be directly challenged banker Jacob Barker and his conduct in the midst of the Panic of 1819. The subtitle of the farce, All Barkers are Not Biters, and its protagonist, a banker named Jacob, personalized the piece because after demonstrating how bankers including Barker behaved poorly in Things as They Have Been!, Taylor used his next play to fantasize about a better future. Taylor also sought to elicit a response from Barker by offering a better model of masculine market economics; he dedicated the play to "holders of Washington and Warren, and Exchange Bank bills" in order to get Barker's attention.89 As noted above, Barker directed the Exchange Bank (along with the Washington and Warren Bank) during the Panic of 1819, when his decision to stop redeeming his notes for specie left many working men with worthless scraps of paper. When a financial panic hit during the play, Jacob, the fictionalized banker, uses his limited resources to pay out specie to those working men and their families who most needed it. Instead of taking care to reimburse his wealthy friends first, he required greedy, acquisitive characters such as Simeon Dubious to wait a few days so he can assist those in want. He poignantly declared that "to the poor labouring mechanic, I will not refuse. "90 Such wishful thinking by Taylor did not change the course of the financial panic or rehabilitate Barker's damaged reputation. In actuality, Jacob Barker's refusal to pay artisans for their bills led to widespread outrage and his eventual prosecution years later.91 Even though he escaped jail time, Barker was so unpopular that he eventually left the city and moved to New Orleans. As Section One demonstrated, rather than abandon the home and its obligations for the lure of independent acquisition in the market revolution, New York's organized working men self-identified as husbands and fathers and engaged the market as family representatives during the first four decades of the nineteenth century. This chapter has shown how as household representatives, working men encountered public economic institutions—such as monopolies, banks, paper money, auctions, and debtors' prisons—and economic cultural figures—bankers, speculators, and dandies—in terms of their effect on the domestic arena and their idealized family-based masculinity. Through this lens, working men viewed financial bodies as potential threats to their household obligations and monetary characters as dangerous because of their competing models of economic masculinity. They also criticized such hazards due to their solitary, rather than collective worldview. Whatever the guise of the public debate—petitions, labor pamphlets, newspaper editorials, poetry, or plays—labor activists critiqued those economic institutions and figures which reflected self-interested or corrupt financial dealings and championed economic institutions and figures who worked hard for the benefit of their households. An organized working men's model of household-based economic masculinity significantly upsets the historiographical argument that early nineteenth-century American men primarily self-identified as acquisitive, individualistic masculine over-achievers who competed in a frenzied grab for whatever they could accumulate. If, during the market revolution, as Richard Latner writes, "the quickening pace of enterprise was matched by the release of individualistic and acquisitive energies," organized men certainly experienced a different sort of revolution.95 However, it is also not accurate to cite a particularized class consciousness as the motivation for workers' reactions to the economic institutions and characters they confronted in the midst of the market revolution. This discussion concludes with an exploration of one of the most illuminating examples of how organized working men seamlessly connected federal financial legislation and everyday domestic obligations, engaging complex and seemingly distant financial policies in terms of how they affected immediate household and family concerns. Loco Foco Family Affected By the Specie Clause Sketched during the Panic of 1837, the lithograph Specie Claws featured two landlord's agents arriving at the door to collect back rent from an unemployed artisan and his starving household.97 The cartoon argued that the threat to this working man's family and all working men's family was their support, along with the Loco Focos, for the Specie Circular. While the political cartoon was not produced by a labor activist, its creator understood well the relationship between public economy policy and working men's domestic obligations. The family of five and a half members in the image (counting the infant for the half) represented exactly the demographic profile of the average organized man's household from the sample group.101 The audience could read the visual clues that the father's empty toolbox contained no tools (they littered the floor), but only "Loco Foco Pledges", the plate on his table was bare, portraits of Andrew Jackson and Martin Van Buren hung on the wall, and his chosen newspaper was the New Era. Such signals denoted that he was out of work, hungry, and a follower of the Loco Foco Party. Another important device to the effectiveness of the scene was that the mother of the family and all of the children looked directly to the artisan husband and father for answers to their circumstances. It was his obligation to respond when they asked: "Father can't I have a piece of bread? ", "I'm so hungry … I say Father, can't you get some Specie Claws? ", and "My dear, cannot you contrive to get some food for the children? "102 Any organized working man with a family would have identified with the portrayal and understood the potential threat to their own household.